Delphi Automotive and Peugeot have extended their motorsport relationship following a string of successes at the 2010 ADAC 24-hour endurance competition, held at the Nurburgring. 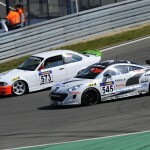 The team hopes to repeat these successes at the 2011 event with a garage stocked with mostly-standard Peugeot RCZâ€™s. The two team cars are powered by Peugeot 2.0 litre HDi diesel engines, supported with Delphi fuel injection systems and powertrain cooling. Delphi hopes that by proving its worth in the world of motorsport, it can enhance its reputation for durability in all conditions. The company is one of the largest suppliers of advanced diesel technologies, and this continued partnership with Peugeot seems to be a winning formula for the brand.